As someone who began racing in FF with an Elden Mk 10, w-a-a-a-a-a-a-y back in 1979 (special bonus points for any of you who actually remember what a Elden Mk10 was – hint: not so good), I was extremely enthusiastic when Honda announced plans to enter the FF arena with the 1.5-liter Fit engine. So, over the last couple of months, I’ve re-acquainted myself with the class and cars (I last raced FF in 1997-2001), developed a budget, bought a car, and partnered with a veteran race team to prepare and run FF in 2010. But first, it’s full-disclosure time. As some of you already know, I work with Honda in the company’s IndyCar Series program, as part of the Public Relations effort, and have done so since 1995. But I am employed as an independent contractor, and this program is separate from my IndyCar work. So, for purposes of “Project Honda FF”, I’m a customer, like anyone else. I’ve placed my own orders for the engine, engine kit and chassis kit, and made my own deposit. Ours will be an independent team, on the same footing with all the others who choose to go the Honda FF route. However, I’m not a novice at this game. Indeed, I’ve been an SCCA racer, on and off, for more than 20 years, in a variety of classes including FF, Formula Atlantic and endurance racing. I even made a stab at “going pro” in the mid-1980s. Most recently, I’ve been running a tube-frame, rear-wheel-drive Honda CRX-Si a couple of times a year in the GT-Lite class. I’m passionate about the sport, and have always believed that FF – a class with no aerodynamics, no ground effects, and more “grip than grunt” (handling over power) – is THE best place for a young racer to learn chassis setup, tire management and race craft, before moving on to the more sophisticated classes. Once upon a time, nearly everyone who wanted to be a professional racer started out in FF, and fields of 30 or more cars were the norm. But, for a variety of reasons, that hasn’t been the case for some time now. I truly believe that Honda’s participation in FF will help rebuild the class and once again make it the best place to start an open-wheel racing career, in addition to making it more fun and affordable for “regular” SCCA club racers. With all that in mind, it was time to get started. Step 1: Buy a car. So, the search for a good FF chassis began. A quick look at recent SCCA national race and Runoffs results soon made it apparent there are several competitive chassis available in decent numbers: the Swift DB-6, Piper DF3/DF5. Citation 94/95F and current-model Van Diemens. All are modern, wide-track designs, with pushrod suspensions and stiff, well-engineered chassis. Plus, I fit in them. That’s not a small [pun intended] consideration, as I am 6-foot-2, 195 lbs – too bloody big, really, to be a race car driver. That fact alone eliminated the Swift DB-1 from my search list. Even though it’s still very competitive – and the most popular FF chassis out there – I simply can’t fit in the cockpit without beating up my knees, elbows, shoulders, etc. I couldn’t find any used Piper DF3s or DF5s for sale (and a brand-new one would be a budget-buster). A shame, because it does appear to be a VERY well-engineered car. After some thought, I also eliminated Citations. They are quite competitive (ask Scott Rubenzer, who won the Runoffs in one this year) and very strong, but are a bit labor-intensive to maintain, and I have no real experience working with them. But I do know Van Diemens very well, having previously raced both an RF86 FF and an RF98 FF2000, and I have a ton of respect for designer Dave Baldwin. There is great parts support and the car is very competitive in FF. There were also several for sale, and I ended up buying the second one I inspected. Originally an RF98 FF2000 Pro Series car, it was later converted to FF specification and run in the professional Ontario (Canada) FF Series. The logbook showed only 7 races – and no crashes – since being turned into an FF, and it hadn’t been run at all since 2004. The chassis floor was carpenter’s-level straight, the fuel cell was good, and there were no leaks anywhere in the oil/water systems. The transmission had been blueprinted, with an aluminum differential; 3-way adjustable Penske/Stimola dampers were fitted, along with a data-logging AIM-3 dash. Sweet. The engine was a fresh Marcovicci-Wenz unit (“dyno time only”). The asking price was $18,500, and it came with plenty of spares: a second full set of wishbones and pushrods, a half-dozen alternate spring sets, and some miscellaneous bits. The only thing it lacked was spare wheels and gear sets. After sitting for so long, it also would need to be taken apart for the surface rust to be cleaned off and all the wheel bearings, hydraulics, tri-pod joints, etc. inspected and replaced as needed. Some quick, in-my-head math on what all that would cost, a bit of haggling over the price, a check, a handshake and the car was mine. 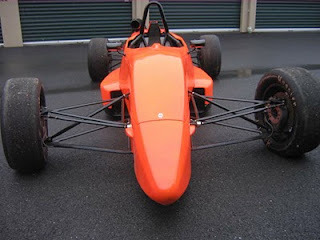 Here’s the Van Diemen as purchased. Yeah, I know, it’s ORANGE. “House of Color Dayglo Orange”, to be specific. I call it “highway-cone orange”.